The other day when at a friend’s house, I offered to make coffee. Reaching for some mugs, I found one which read: ‘I love my mum’. And suddenly I was knocked off balance by a flood of emotion – an unexpected wave of grief. I ‘lost’ my mum last summer in the sense that she died. She slipped away peacefully in a wonderful hospice with her family around her. But we had ‘lost’ her as the person she was long before, as over the ten years before her death she gradually succumbed to dementia with Lewy bodies. During that time of long, slow grief there have been many waves of emotion. I remember sitting with her, both of us in tears, when the family first agreed that she needed someone to come in each morning to ensure she had breakfast and took her tablets. She was insisting through her tears that she could manage and didn’t want anyone to help and I was explaining how difficult it was to go home after a visit because she clearly wasn’t coping. How hard it must be to face the loss of your independence. Then there was the catch in my throat when, having spent an afternoon with her in her house, she politely asked if I could give her a lift home or at least to the train station. Telling her that she was at home only led to a wall of fear and frustration as she could not at that moment recognise where she was. The familiar had become alien and she wanted to get away. And later the struggle to hold back the tears when she said a clear ‘thank you’ as I was wiping her bottom. I am not sure I could have managed that indignity with such grace. Other times we laughed, like when I woke her in the morning and she said she had had such a busy time – she had been to Wales and missed the train on the way back. ‘What a relief to be home at last!’ And there were moments of joy like when she held her tiny new great-grandchild in her arms. My mum had been an intelligent and gregarious person, always interested in people, always ready for coffee and a chat. Her home was open to everyone and she had many to stay from all over the world. 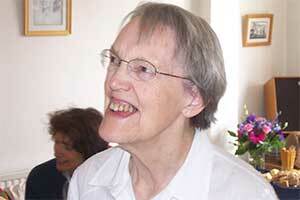 The woman who died last summer was still our mum and very precious, but she was not the same. She could not walk, or feed and care for herself, or speak intelligibly. In some ways it was a relief to see her go. 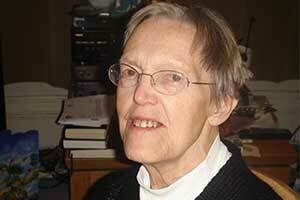 She was just short of 90, had a strong Christian faith and, to her, death was not the end. But that mug with its simple message triggered a wealth of feeling about the mum that she used to be and how much she had meant to me over the years. I loved my mum.